Au travers de cette application, vous trouvez une multitude de fonds d’écrans en HD pour votre iPad . Life just looks better in HD. 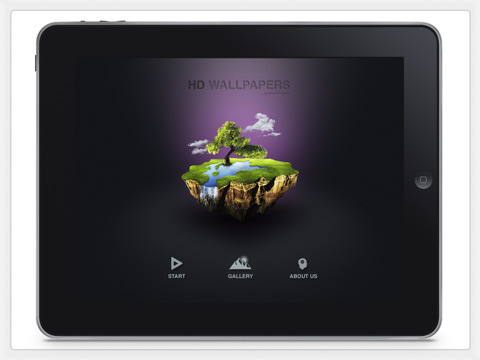 Show off your beautiful display with crisp, vivid and stunning landscapes. Hundreds of images have been painstakingly color corrected, cut, cropped, and removed of any noise or artifacts. We have a passion for breathtaking imagery and our sole intent is to bring you the absolutely best possible. 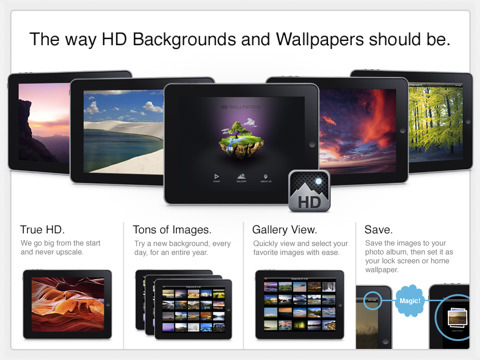 – Hundreds of High Definition Landscapes. ▪ Go ahead, change your background everyday. – Gallery View or Standard View. ▪ Swipe to go left or right in either view. Gallery shows 20 images at a time. Simple. Easy. ▪ Found a favorite? Hit the save button to save the image to your photo gallery. ▪ What else can be said, updates are free. Just don’t expect cake and ice cream everyday. The only way we really know if you are satisfied or not is by rating (★★★★★, wink, nudge) our app, so please take a second and rate us. But, if you are the kind that willingly throws caution to the wind, arm-wrestles tornadoes, dives to the deepest depths of the ocean because you thought you needed a relaxing five minute break, or dines with the Elder Yeti King Rak’awn then we heartily invite your written reviews in all of their glorious glory. ✪✪ Update: Our own personal research showed that 90% of iPad users were only using the device in landscape mode, switching back to portrait for only specific apps. After reading through your feedback future updates will include 1365×1024 sized images. 1024×1024 is not a standard we will use because it shifts your viewing perspective and you cannot obtain a full-scale viewing in standard mode (the images are scaled down). You will still get full size browsing (1024×768) but you will be able to scale them to your liking in portrait mode. It takes longer to source larger images and even harder to find ones that pass our requirements but we care about doing the right thing. Expect an update within a few weeks, baring any wait from the approval process.